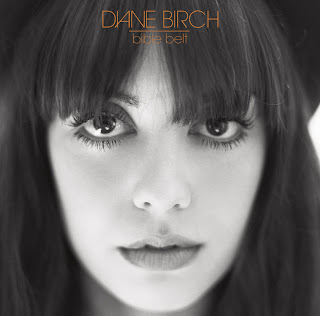 Diane Birch's first CD called Bible Belt hit stores June 3rd and hit iTunes Top 10 albums the same day! Birch who has been compared to Carole King, Amy Winehouse (without the drama LOL), and Karen Carpenter wrote all 13 songs on this album. Only in her 20s, she is a self-proclaimed "old soul" who over her few years has searched for herself musically. And I think she has definitely found herself. Her voice is very captivating and the lyrics draw you in. The daughter of a preacher, living between Zimbabwe, South Africa and Australia, before her parents finally settled in Portland, Oregon, Diane Birch absorbed a unique and very cosmopolitan perspective on life and rapidly cultivated a very individual style that defies categorization. The buzz is building as Music Week announced, "Diane has a voice and songwriting ability that will connect with truly global audiences." Her childhood is what inspired the album title, Bible Belt. Birch says, "Because my dad was a preacher, the very religious upbringing that I had had a huge impact on my life in a very restraining and constricting way." She goes on to say that "Now that I'm older I notice that all these things have crept into my work. I'm constantly talking about Heaven, angels, and forgiveness. I'm hugely inspired by church hymns - their chord structures, their colors. I feel like all of these things are a part of me. It was a form of constraint for me as a child but it has fueled my creative fire." You can view her video "Nothing But a Miracle" on Amazon and also listen to samples of the remaining songs on the album. I think you will be pleasantly surprised by this up and coming artist. AND if you would like to have a copy of Bible Belt - I am giving one away!! This giveaway will end at 11:59 PM EST July 31st. Winner will be chosen using Random.org. This message is brought to you courtesy of One2One Network. I would like to enter. I found you from the MommyPR blog. I follow via Google, heard Diane Birch on David Letterman this week, would really like to win!